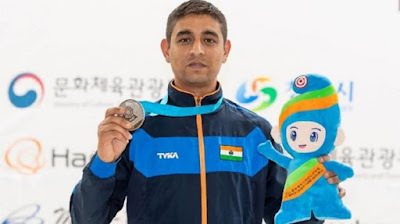 Indian shooter Shahzar Rizvi grabbed World No. 1 rank in 10m air pistol rankings after achieving 1654 points. He won a silver medal in the recently held World Cup in Changwon, Korea. The other Indians in the top-10 are Jitu Rai, who is placed sixth on the chart, and Om Prakash Mitharval, at the 12th spot. Among the women, Manu Bhaker was the only Indian in the top-10 of the women's 10m air pistol rankings at the fourth spot. Question 1. What is the full form of ISSF? Question 2. Which Indian shooter recently gained World No. 1 rank in 10m air pistol? Question 3. Manu Bhaker is associated with which sport? Question 4. Where was the ISSF World Cup 2018 held?